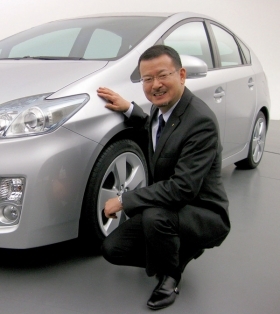 Toyota design chief Wahei Hirai with a full-scale model of the third-generation Prius. Hirai wanted a look thats avant-garde and high-tech -- and, considering its a hybrid, screams green.  Sharply creased corners reduce drag.  A bolder Toyota badge, placed more forward, gives grille a more horizontal feel.  Smaller grille slits convey the futuristic feel of electric cars. TOYOTA CITY, Japan — For a glimpse of Toyota's future design trends, check out the Prius. The third generation, debuting today, May 18, in Japan, stays true to the line's role as a vanguard of futuristic styling and sports many new elements that will be popping up soon in other models. Chief among these are the sharply creased corners, the forward placement of the Toyota badge, a lowered grille and styling that Toyota's global design chief Wahei Hirai calls "free-form geometrics." The goal was to create an avant-garde, high-tech look that also screams green. "Prius is a showcase. We can try many design cues here first," Hirai told Automotive News at Toyota Motor Corp.'s design studio. "This has to be symbolic." A key priority was improving the old Prius' already slick 0.26 drag coefficient. The redesigned version ekes out 0.25, the best in Toyota's lineup. The 2009 Camry, by comparison, has a drag coefficient of 0.28. The Corolla's is 0.29. To get there, Hirai introduced so-called Aerocorner on the front and back. The flowing curves of the upper body end in a sharp edge that creates a flat surface before and after the wheel well. This helps stabilize airflow and reduce turbulence around the car. Toyota plans to use the trick in other models. More underbody paneling was added, and the rear overhang was angled up to improve aerodynamics. New rear fins under the car aid stability. The upper grille slits in the old Prius became even smaller, making the big under-grille do most of the engine cooling. A lower main intake creates less air resistance. But the diminutive upper vents are also supposed to convey the futuristic feel of electric cars. "It's an anti-traditional grille," says Simon Humphries, general manager for global design. "It's one step closer to the ultimate goal, which is going grilleless." Toyota also experimented with making the hood badge a bit bolder. Instead of being tacked on as an afterthought, it is incorporated into the entire flow of the car's character lines. The idea is to give the grille a more integrated, horizontal feel. Expect to see this on other models. Hirai uses the term "free-form geometrics" to describe the juxtaposition of rigid geometric shapes against flowing organic ones. The old Prius was rounded on the front and back and had a gentle curve to the side panels. But Hirai injected the new one with sharp angling in the front fascia and a hard crease down the side. Inside, Hirai tried to highlight the car's high-tech hybrid pedigree. The center panel's gear shifter is smaller than its counterpart in traditional cars. The Prius has shift-by-wire, so Hirai wanted more joy stick, less stick shift.